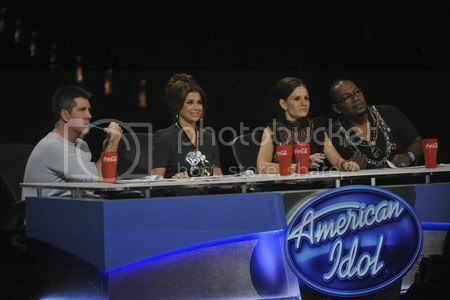 American Idol: You call this an improvement? So as Fox’s “American Idol” turned the page from Season 7 to Season 8, they vowed some improvements to help boost ratings. Well, we’re finding out that there was a bit of hot air in those promises. Yes, they added a fourth judge, and maybe they extended Hollywood week on TV another seven days, but an improvement? Not really. In fact, they barely showed any performances last night. I think they showed more of the judges deliberating and the contestants’ agony waiting for said deliberation than actual singing. Something is getting stale and the producers of the show can’t seem to learn any new tricks. But I’ll say this…the talent this year is pretty freaking good….and I believe it may carry the ratings regardless of the production. Anyway, as the 72 remaining contestants got ready to sing in front of the judges solo but with some backup singers and a keyboard, the judges began their unenviable task of weeding out the mediocre ones. Then they were separated into four rooms..and you would think that two of the rooms would stay and two would go home, but that’s not exactly what happened. Only one room was sent packing, and I’m pretty sure there were no more than 15 or 20 in that room. Among them, Kendall, the first girl of the night, attempted Carrie Underwood, and while yours truly is not a Carrie fan in the least, Kendall made Underwood look like Martina McBride…..Keneshe Young, the 16 year old from Cincinnati, who I thought was great, did not make it past this round…India Morrison, who led a fantastic group performance that included buddies Danny and Jamar, did not stand out enough on her own…..and Michael Castro, Jason’s brother, didn’t stay in Hollywood either, though they haven’t shown him performing since his initial audition (really now, how is that possible?). Anyway, some of these folks moved on and I’ll add my comments…..Matt, the dueling piano player, sang Ray Charles’ “Georgia on my Mind” and it was phenomenal. I’ll go as far as to say Matt will be in the Top 36, maybe the Top 12 even….Jamar sang “Hey There Delilah” and if you can imagine a skinny black dude singing a skinny white kid song, that was about it. I wasn’t impressed but the judges know he can do better….Danny meanwhile, took on an even stranger song choice, “I Hope You Dance” by LeeAnn Womack, and well, let’s just say this guy can make anything sound good. Danny is also going to go far….Anoop sang “My Perogative” and I don’t know about this guy. He looks like such a nerd but man, what a voice….Scott McIntyre, the legally blind dude, sang Daughtry’s “I’m Goine Home,” but he’s not. I know there is a sentimental thing here, but I don’t think Scott is that great of a singer…Lil Rounds, who I have a hard time believing is only 23, also made it through and she has enormous pipes and potential…Nathaniel, the crazy kid who sang with Kristin and Nancy’s “Divas” group, made it through but I just don’t see him getting far….same with Joanna Pacitti, who has had 2 record deals but to me, sings through her nose and seems to be a bit too emotional…..Steven Fowler, who forgot the words twice and even walked off the stage before finishing, was so talented that they could not send him home. So much for Simon saying that if you forget the words, you’re done….Ju’Not, who also sang the Delilah song, did a much better job than Jamar did and I’m saying you should keep an eye on him…finally, Tatiana, who they had switch rooms in mid-deliberation, gave her best performance yet but geez, she is certifiably insane. Ratings, is all I have to say. There were some other performances worth noting, but I don’t know if these made it to the next round or not….Adam, who kicked the performances off last night with “Believe” by Cher, was very emotive and I just can’t for the life of me figure out why these kids are choosing these ridiculous songs…..and Nick Mitchell, a.k.a. Norman Gentle, who keeps morphing back into Norman mode and keeps moving on. Dude, lose the headband and just sing…you’re freaking talented and don’t need to put on that stupid act! Anyway, I think we’ll be seeing these two (or three) again but I’m not 100% sure. I am sure, though, that they only elimininated 15-20 contestants last night, after all that. But the rest will be pared down to 36 tonight, after learning their fate at the “judge’s mansion.” Are you kidding me? This show now has to flaunt its money? Well, I guess they deserve a few upgrades here and there after seven seasons of success and being the #1 show on TV. What do you mean Scott Macintyre a great singer? You may have a different perspective on what is good but for others like me, he’s great. You know why? HE’S BLIND, man. You don’t see blind men everyday risking their capabilities to show they can rise above others in singing. Plus, he also have a unique timbre that maybe, you didn’t notice because you have underestimated him. By your writing I’ll swear I’ll never read your works as a enthusiastic reader again.